RP18357PB is rated 5.0 out of 5 by 2.
will U7700 adapter work on this faucet? I have a ashlyn collection roman tub trim faucet installed on my tub and need to replace the aerator. Which replacement aerator should I use? I have the T2710 Roman tub faucet. Is a flow-restricting aerator available? I have the standard aerator, which straightens and aerates the water stream, but it does not restrict the water flow. 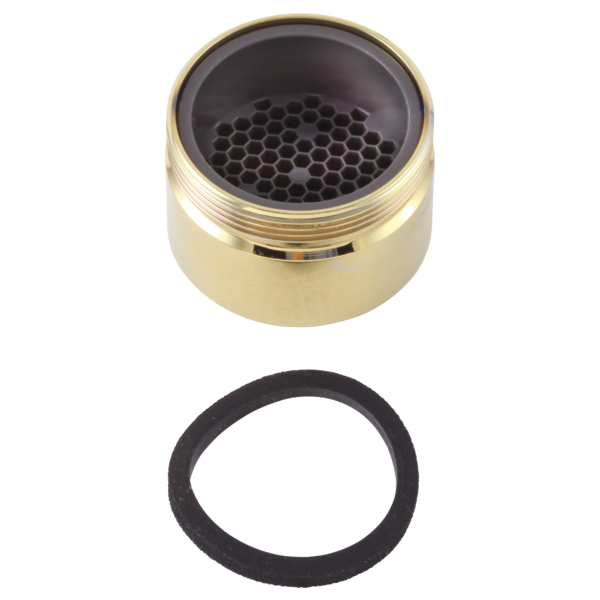 Is a flow-restricting aerator available (e.g., 2.5 gpm) that would fit inside the existing chrome/brass screw head? What is the size of this Aerator? Do you have any adapters for the T2710 Classic Roman Tub Faucet Trim? Eric, I share your frustration. I am actually having a CNC machine company fabricate an adapter here in Columbus, Ohio, that will allow me replace the existing aerator with threads to attach a standard 1/2 inch hand shower to the faucet so I can more easily bathe my dogs. Let me know ASAP if you're interested. I think I can have several made for the same cost as one due to their minimum charge restrictions. Jim N.
Thank you for your question. Delta Faucet model # RP18357 has a thread size of M28 X 1-6.